First impressions of this set were generally undewhelming. It was a mech, kind of lumped in with the construction releases of 4526 Batman, 4527 The Joker, 4528 Green Lantern, 4529 Iron Man, 4530 The Hulk and 4597 Captain America (and in my local stores literally placed in the middle of them on the shelves). Yet upon closer inspection, it is certainly its own set individually with some awesome minifigures. Could this perhaps be a small diamond in the rough? Without a doubt, these minifigures are the focal point of this set. Superman, Wonder Woman and Lex Luthor are all exclusive here. This Superman minifigure is only available in this set though it was also given away during the 2011 Comic Con. There are "Man of Steel" variations of the character from the latest cinematic release. This Wonder Woman minifigure is only available in this set, and has no variations or previous releases. 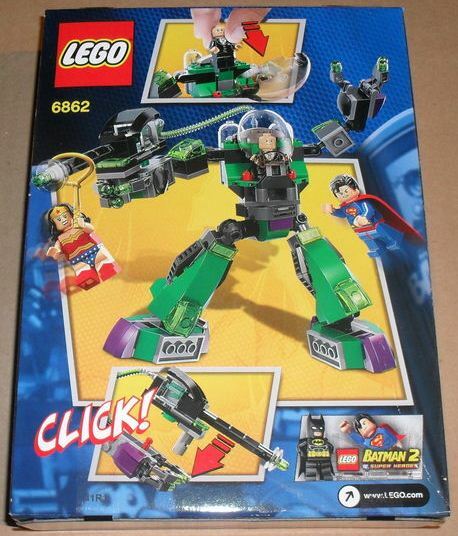 This Lex Luthor minifigure is only available in this set, though has a variation in the 30164 polybag. The mech is reasonably articulated, giving plenty of room to set it up for battle. There are plenty of poses that can be made, as Lex Luthor battles Superman and Wonder Woman. That being said, outside of this feature the set does not posses a great degree of playability; it all depends on the builder's creativity. The build itself is very simple and shouldn't be challenging for even reasonably young Lego enthusiasts, though they may need a little extra adult help! The retail price on this set is $19.99 US. To see what we get for our purchase, let us first look at the minifigure sales again. Already we can see that the minifigures sell for more collectively than an entire set costs at retail price. Already, purchasers are ahead without having to do anything other than open a set. As we can see, the prices are fairly similar, as mech sets combine multiple figures with larger parts. Between DC and Marvel, Lego has thus far issued 29 sets under the Super Heroes line, polybags excluded. Of this, 15 sets are based on DC characters leaving 14 from the Marvel Universe. Breaking the DC sets down further, there are 10 Batman-centric sets, 4 Superman (3 Man of Steel, 1 Justice League) and 1 set based on the Green Lantern maxi build. This set was released in December 2011 and is still currently available. It was available in many stores and easily accessible to consumers, especially considering the low price. The box art is fairly neat with the minifigures prominantly displayed. I am not a fan of the yellow text on the box front as it makes it a bit difficult to read. The back is well laid out, similar to a comic. The Brick Picker data is currently a bit off for this set, due to a crossover in listings between this and the 6862 Secret Space Voyager. It is obvious here that there can be issues with reporting, as it is unlikely someone will sell thise set at $4.50 sealed. A sale of $34? Score. Due to people selling sets on bricklink listed as "new" though having been opened and minifigures removed, it doesn't really give a truly accurate portrayal. What can we do with this data? Well we know there has been a high priced sale on bricklink. We know that prices over the last year on eBay are up and down, looking at the returns. Finally, we know the minifigures are worth more separated than the set is sealed. Mechs certainly do ok though not as well as I would anticipate (The Baxter set is an exclusive).The minifigures will continue to push the sales of this set. More than likely we will see Superman in another set in the future, however, Lego has made a point throughout this entire Super Hero theme (between both Marvel and DC) of not only spreading characters out throgh their sets, but also giving many variation prints making them exclusive to particular sets (see Iron Man, Batman, upcoming Riddler as examples). The DC Super Heroes line currently has a healthy CAGR of 22.62%, above the standard 11.36% which is incredible considering there hasn't been a raft of retirements. As such, it can be expected this set will appreciate in value after it goes EOL at a reasonable rate of return. This set can be displayed easily, posing the mech in any way you like to make it more appealing. The figures are an interesting conversation piece, as they all are exclusive, however I don't believe the mech itself commans any particular eye catching features. While the mech itself isn't exactly appealing, the vibrant colours and exclusive minifigures make this set a must buy for comic book fans. The minifigures alone sell for more than the cost of a brand new set at full retail price, and will only increase in value as time progresses. With Lego churning out Super Hero sets and changing prints on the characters to keep them exclusive, the collectability of minifigures will only increase. When the Man of Steel sequel is released featuring Batman, it will open up the character even more to mainstream audiences, as Batman is currently the gem in the DC Universe. The greater the exposure, the greater the increase for potential profits as new fans are drawn in. If you can find this set cheap, it wouldn't hurt to hold onto a couple.